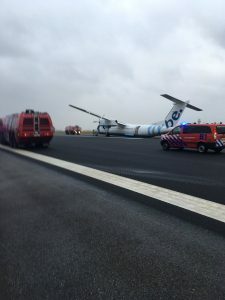 A Flybe passenger plane crash landed at Amsterdam’s Schiphol airport after part of the aircraft’s undercarriage “collapsed” as it touched down in bad weather. Flight 1284 from Edinburgh to Amsterdam had already been affected by the poor weather created by Storm Doris and had suffered a delay of 90 minutes to its scheduled take off time. The aircraft came to a halt on the side of the runway after the incident and emergency services attended. No one was injured. 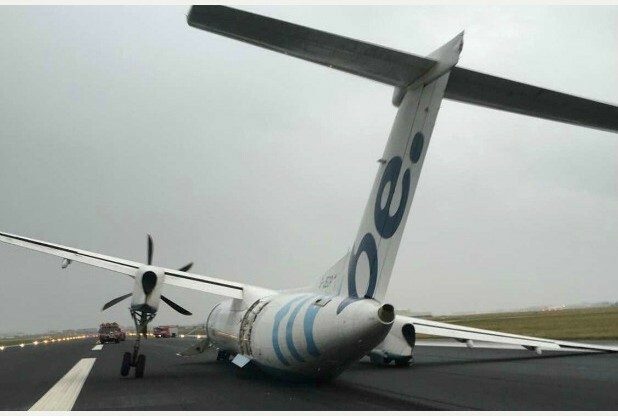 Pictures and video show the Flybe plane tipped to its side on the runway after its landing gear collapsed during touchdown. Footage emerged on social media showing the precarious landing before passengers were evacuated from the plane. It came just hours after Flybe flight 783 from Glasgow to Birmingham made an emergency landing after the pilot was forced to shut down one of its engines mid-air due to a technical fault. Engine shutdowns are fairly routine, and all twin-engined planes are designed to keep flying safely even if one engine fails at the worst possible time, on take off. Elsewhere, more than 100 flights have been cancelled or diverted due to high winds. An Icelandair Boeing 757 flying from Reykjavik to Manchester had been holding while waiting for a weather improvement, but once the fuel fell below the legal minimum, the captain declared an emergency and made a safe landing.